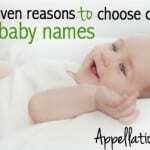 I love helping families settle on The Name for their new children, both in my Ask the Name Sage column at nameberry, and here for Saturday #namehelp. One of the most common questions I get? How to honor a loved one when the loved one’s given name isn’t terribly appealing. 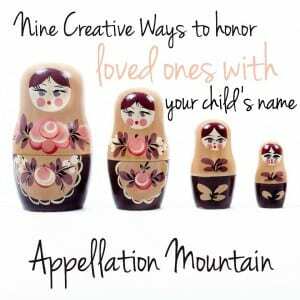 You adore your only great aunt, and would love to name your daughter in her honor. Except your great aunt is Beulah, and you cannot imagine a baby named Beulah. Or your father is Herbert, and while you like the clunky-cool sound, your dad hates his name, has always answered to Hank, and has forbidden you from saddling another generation with a name he considers burdensome. Or maybe you’ve got great classic names on your family tree. But Elizabeth and William feel a little too flat and ordinary to your ear. 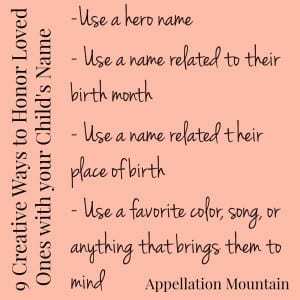 Some will insist that the only way to name a child after a loved one is to use the actual name. Fair enough. And family names aren’t for everyone. 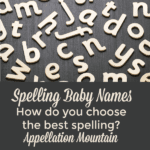 But if you like the idea of honoring a loved one, and you’re open to some creative name-storming, there are lots of ways to name your baby after someone – without using actually using their name. 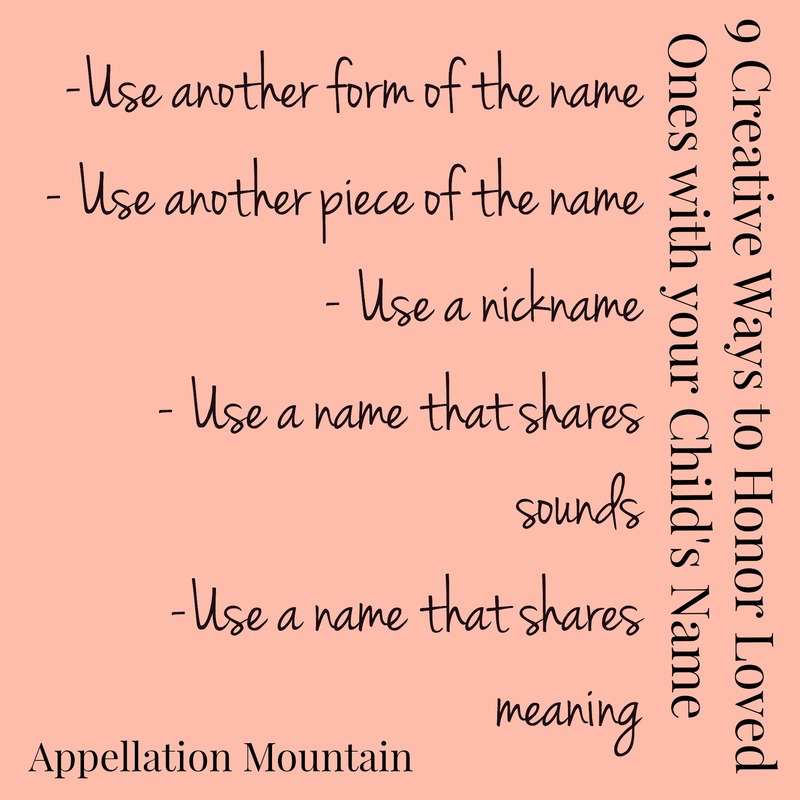 Read on for nine of my favorite ways to reinvent a loved one’s name to make it fresh and new for your child. Consider shorter forms and elaborations, translations into other languages, and traditional nicknames. Try looking up the name’s family tree on Behind the Name. (Enter the name. Most pages include a section for related names, and a link to the name’s family tree, before you reach the popularity statistics. Not every name has a tree, but many do.) You might be surprised by some of the possibilities. Carol or Carl could become Caroline or Charlie. Elizabeth becomes the Italian Elisabetta or the trim, vintage Bess. William is reinvented as Willem. This might be especially powerful if you can find a heritage choice. If you have Cornish heritage and a grandpa named George, Jory is a thoroughly modern possibility that incorporates both. Of course, the opposite is true. I thought MacArthur would be a smashing middle name for our son, honoring my Italian grandfather and my Polish husband. Except we’re not Scottish. That bothered me exactly zero, but my husband couldn’t wrap his head around the idea. So Great Aunt Beulah’s name doesn’t have any variant forms. But how ’bout Beulah’s middle name, maiden name, or surname? Was her maiden name Sloane? Or maybe she chose Rose for her baptismal name. There could be plenty of promising options besides Beulah. Let’s pause for a minute here and talk about something controversial. If you’re naming a daughter, there’s no reason to avoid family surnames. Girls are just as deserving as boys of carrying on family names. And yet, there are those who will argue that naming a girl Parker or Jameson is stealing from the boys. 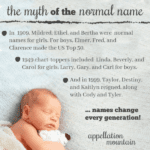 I disagree, and a growing number of children – boys and girls – answer to names that don’t clearly announce their gender. But it’s worth knowing how others might perceive the name. There’s more than one way to think about nicknames. You could honor your grandma Elizabeth with a daughter named Eliza, Libby, or Beth – a nickname for her given name, even if it’s one she never used personally. Herbert prefers Hank, so why not name your baby Hank? It might be a nickname, but it was his name. You might even use Henry – the formal name traditionally associated with Hank. Maybe Beulah’s sisters called her Birdie, which could open up a long list of avian-inspired names. Or Elizabeth was known as Sunny, which suggests Summer or even a bold sun-related name like Soleil. Plenty of unrelated names share sounds. This works really well when it’s the first syllable, like Willow Smith, named for dad Will. But it’s not limited to first syllables. I can imagine a Lawrence with a granddaughter called Wren. Or a Lauren with a niece by the same name. Another spin on sharing sounds? If you’re honoring someone known by his or her initials, you might be able to simply repeat the initials in the next generation. Backstreet Boys member A.J. MacLean was born Alexander James. His daughter is Ava Jaymes – a name that clearly nods to dad, both with the middle and the shared initials. And, of course, some cultures believe that using the same first initial is an appropriate way to link names. Ashton Kutcher explained that Wyatt Isabelle’s middle was a nod to Mila’s grandfather, Yitzhak – Isaac. 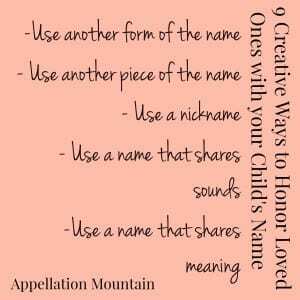 Some of the most interesting possibilities come from names with a shared meaning. 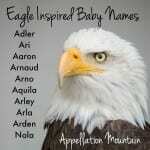 Arnold means eagle, and there’s a long list of possible names that share that meaning, but have a more contemporary sound. Margaret could have a great-niece called Daisy or Pearl. In Isabel Allende’s The House of the Spirits, Clara’s daughter is Blanca, and Blanca’s daughter is Alba. All three names relate light or white. Is your loved one a lifelong fan of a sports team? A singer? Joseph is my great-grandfather, but the Joe Lewis Arena is where the Red Wings play – and my Detroit-born husband is a superfan. A child named Joseph would have layers of meaning to his name in our house. Huxley reminds me of one of my father’s authors, and Nathaniel brings to mind one of his favorite singers, Nat King Cole. Your mom Geraldine was born in May? May or even Mae might be a subtle honor name. Every month has associated gemstones and flowers, many of which make great names, especially for girls – though not exclusively. Astrological signs can suggest name possibilities, too. If your early August born grandmother was also the picture of a fierce Leo, naming your son Leo or Leopold or Leonidas could be a powerful way to connect their names. Place names from your family’s past could be a great source of inspiration. What was the street name of their family home? The village where they came from in Europe? The town your mom lived in her whole life? For Catholic families – or those with Catholic heritage – you might also look into the patron saints associated with some of those places. Genevieve is the patron saint of Paris. Josephine Bakhita is the patron saint of Sudan, Sebastian is the patron saint of Rio de Janeiro. I can imagine a classic cars enthusiast being delighted with a grandson called Ford. Maybe Beulah’s favorite color was purple and she loved violets. Violet might not have anything to do with Beulah’s name, but it can evoke her memory just as powerfully. 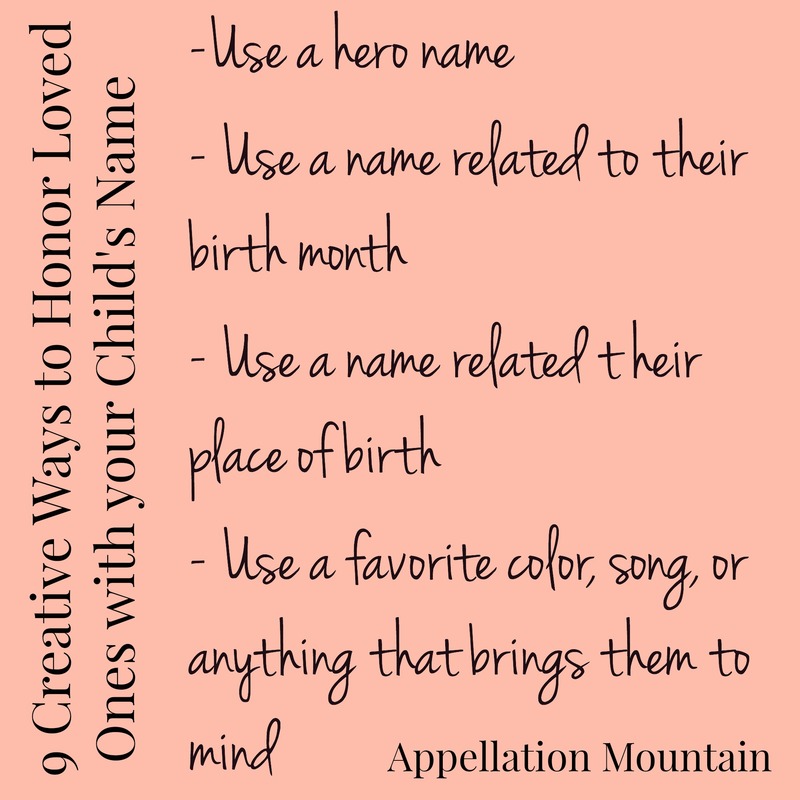 Have you found a creative way to name a child after a loved one? Are there any approaches you would add to this list? 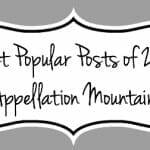 Most Popular Posts of 2015: Advice, Lists, and More! We used Donovan as a nod to my husband’s grandfather Don. We also used Boone for my grandfather as his nickname was Booney. It wasn’t something I had ever considered before. It’s a Jewish tradition to name your child after the last deseaced member of the family of their gender, and although my dad isn’t religious, it was very important to my grandma that I (as her first grankid) be named after her mother Mary. My little cousin also has the middle name Jasmine to honor our great-grandfather Jack, and my brother was almost named Carson for a my moms grandpa. We wanted our son to have a short Gaelic name to go with his LONG Irish last name (9 letters), so we named him Liam (which was #103 on the list of boys names at his birth–now popular). He has both his grandfathers’ names as middle names. It also helped that his name was the Gaelic of one of my husband’s favorite uncles (who died a few months after he was born). Lots of memories. My middle name is a mashup of my parents’ maternal grandmothers: Maria + Mary =Marie. Which is in the top 3 middle names for my generation, but I have the story to go with it. My eldest daughter is a mashup of my grandmothers- Estelle and Betty became Elsbeth. Betty is not a fan, but I still love it, and the name still reminds me of her and connects my daughter to her, and in the long run, that was what was important to me. What I do think is cool, although I didn’t realize it at the time, is that both of our girls’ names also have meaning to my husband, whose family was highly dysfunctional, and who ended up taking a lot of his moral values from superheroes. We gave my youngest the middle name of Robin to honor my grandfather, but come on – it’s Robin. We named my oldest Gwen to honor my late stepfather George,and now there is a Spider-Gwencomic. I love that his “family” got some play in the names, too. We honored my dad with our firstborn’s middle name by using my dad’s dad’s first name, which was HIS mother’s maiden name. A little convoluted to an outsider, but my grandfather’s name is highly unusual and very distinctive, so it’s very special to my dad. And we gave my dad his choice of how to honor him and he chose his dad’s name. Since we have only boys, we considered honoring our moms through using their maiden names or dads’ names, but we ended up giving our youngest a masculine version of my mil’s name as his first name, and a surname from my mom’s family tree that has special significance to my mom and I as his middle name, and he goes by a nickname for his middle. It’s been a really meaningful choice, and it perfectly fits my son. Love these suggestions! We plan to use Jane if we ever have a girl. To me, it honors my husband’s mother and my mother. His mother is Joanne and mi e is Lorraine. Jane and Joanne are both forms of John and Jane and Lorraine rhyme/have the same ending sound. I’ve also thought about Annika to honor our moms (whose middle name is Ann) and my sister Jessica. Another name I love is Fiona, to honor my Irish grandma named Florence. Mash-ups! How could I leave mash-ups off the list? Love Jane and Annika, and what a great way to honor two loved ones with one name. And another Lorraine-Joan/Joanne/Jane connection. Lorraine is the region in France where St. Joan of Arc was from (Maiden of Lorraine). So for Catholics, naming girls Lorraine was seen as an alternative name for recalling St. Joan (of Lorraine). Anagrams! Rearrange letters and see if there’s another name you can use. You can honor Edna with Dane; Teresa has the same letters as Easter, Lisa’s grandchild can be Isla or Ilsa. If there’s too many Ethans in the family, use Thane instead. Grandpa Karl can be honored with Lark, and Neal’s grandkids can be Lane or Lena. Other anagrams include: Amy (May, Mya), Maria (Amira), Rona (Arno, Nora, Roan), Tate (Etta) and York (Kory). Yes! My grandmother was Edna, which is a very flexible name. Dane, Dena, Edan/Eden, Neda, Dean, Enda, Ande, Enad/Enid, etc. The possibilities multiple if you add in middle names, too. Another trick could be to find a name that was popular around the same time. Herbert could be honored with Arthur, for example. My grandfather was Melvin. My grandmother called him “Mal”, so I considered Malcolm. I also considered Frank or Franklin. Subtle, and not for everyone, but I would have been reminded of my grandfather everytime I said Franklin.